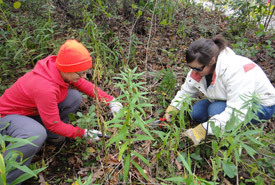 NCC's Conservation Volunteers program is a great way to get involved. Join us in caring for Canada's natural places. Explore unique habitats, observe rare species and experience conservation first-hand alongside NCC staff in the field as a Conservation Volunteer. To learn more about the events hosted by the Nature Conservancy of Canada's Ontario Region, visit the Conservation Volunteers website or call Laura Robson at 519-826-0068 ext. 257. 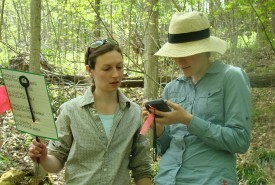 NCC encourages research on our properties and welcomes applications from all sectors of science. Our research permit process is designed to ensure that we have a record of work conducted on our properties and are aware of who is accessing properties, so that we can ensure that biodiversity is protected. Please view the application for more information. On Pelee Island, we are also able to accommodate researchers at our Ivey Research Station (dependant on availability) and the Pitman Research Cabin on NCC's Gravelly Bay property, Long Point. If you have any questions or would like to see a list of NCC’s priority research projects, please contact ontario@natureconservancy.ca. Other field volunteering opportunities may also be available in your area, including becoming a volunteer steward on one of our properties across Ontario. To find out how to get involved, send an email to ontario@natureconservancy.ca. Be sure to let us know where you are based, or which NCC property you're interested in helping out with.